The Perth Mint's Lunar II Year of the Rooster gold bullion coins will be issued on 12th September 2016. These popular coins celebrate the 12 animal stories of the Chinese Lunar Calendar and are valued for their purity. 1/20 oz Lunar II Rooster Gold 2017 coins are a smart way to add pure gold to your portfolio. They also make great gifts for children born during the Year of the Rooster. The Lunar II series began with Year of the Mouse coins in 2008 and will end in 2019 with the Year of the Pig. Each Australian Gold Lunar II 1/20 oz Rooster is struck from fine .9999 pure gold. These striking coins tend to be snapped up quickly due to their purity, unique design and limited mintage. Why choose the 2017 Lunar II Australian Gold Rooster 1/20 oz coin? 1/20 oz Gold Roosters are an affordable alternative to the larger denomination coins in the series. They're the ideal choice for new collectors and a great way of acquiring one of the world's most popular bullion coins. As a partner of the world's most famous mints, CoinInvest.com is ideally placed to offer its customers the latest bullion coins at the most attractive prices - like these 1/20 oz 2017 Lunar II Gold Rooster coins. 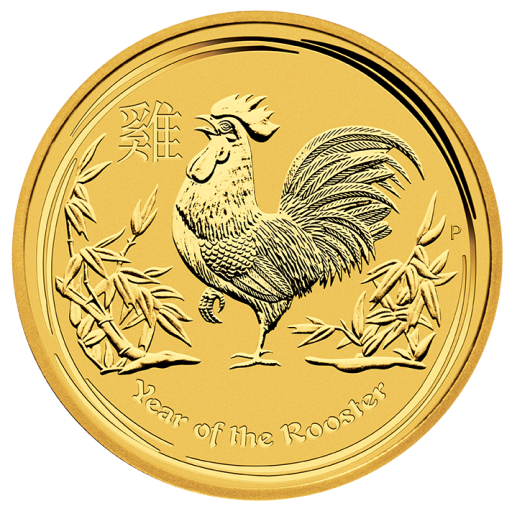 Boost your portfolio with these pure gold coins or choose them as a thoughtful gift to celebrate the Chinese Year of the Rooster.